In this digital age, a normal human being will visit the search engine at least three times a day. From minor entertainment searches to major educational researches searching the internet is a norm. Smart Search provides results when results are needed. 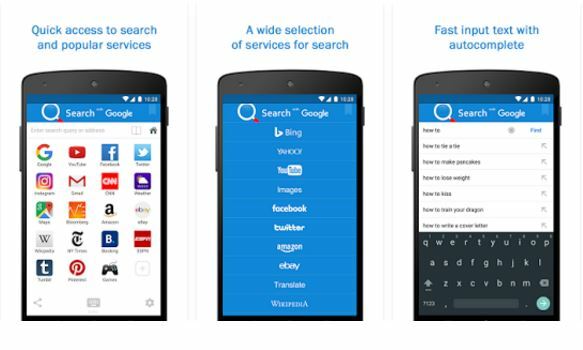 Smart search is an android app released and available on the play store for free. The app mainly focuses on fast delivery of results from search engines. Smart search also focuses on bringing you right results while using the smallest amount of your data. Smart search provides users with an easy way of getting search results from various search engines like Google, Bing and other popular web services like YouTube, Amazon, eBay and Wikipedia. Filled with a lot of positive reviews coming from Android fans who seem excited and love the app, the app developers continue to promise better updates in the near future. The fans report a clean interface and easy to install function for these app. Thousands of installs on Android devices have encouraged new updates and promises of better roll outs. the developers are keen as to fix any bugs thus leaving contact information on the play store with its light data usage and fast results the app has continued to gain more following. The app can be used on latest and up to android 4.0 hence covering major android users. Smart search comes with an easy to use and navigate layout which is not complicated at all. The app comes loaded with an improved design and new speed dial options hence faster results. Smart search continues to receive updates regularly in order to keep up with the evolving technology . The app boasts of being super light since its only 5.8MBs in size.